There are a couple of things I know for certain. One of them is that my potato basket never runs out here. Never. It’s another one of those Nordic mysteries. Whenever I scour the fridge and pantry trying to decide what to make, they’re always there. Looking at me. With all their beady, little eyes – because sometimes I leave them there for a little too long. And sometimes I overlook them on the purpose. Not because I don’t love them. I do. But to eat traditionally in Norway means to eat a lot of potatoes. A lot of boiled potatoes. And while I do enjoy a traditional meal, I also relish the potato’s versatility. So, after days of walking past my potato basket it hit me. Latkes. Those crispy potato cakes are a winter delight. And they must be buried in my subconscious right now from reading so many food magazines that feature them for Hanukkah. But it’s a curious thing why we don’t make them more often. Simple, made with basic ingredients (including those favorites, onions and potatoes) and a perfect alternative base for a medley of toppings. Hmmm. A base with something on top. Like an open sandwich. Or smørbrød. But made with potato. Sounds perfectly Norwegian to me. And so began the shredding of my dear potatoes. 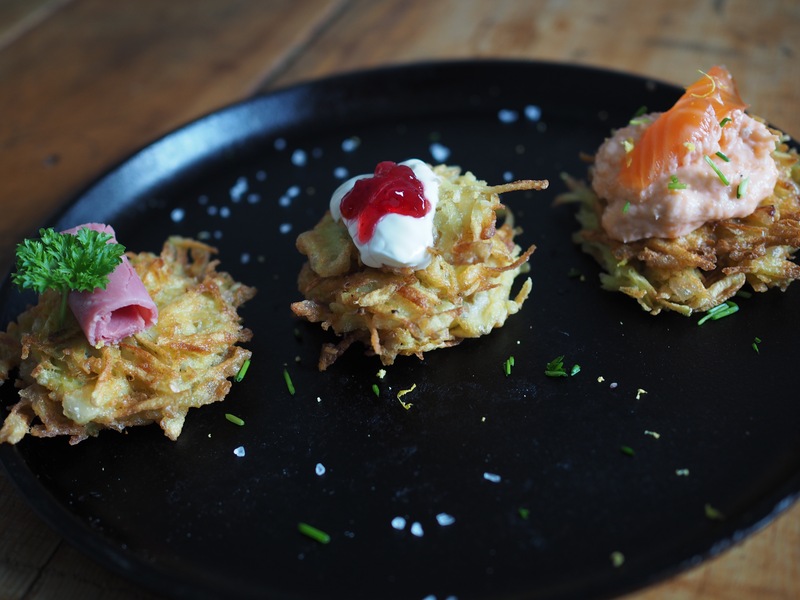 I decided to make my latkes a bit smaller so they could be used as appetizers or little bites. You, of course, can make your latkes any size you wish. The starchier the potato you use, the crispier the latkes should be. And the best part of the latke is deciding what to put on top. I served mine three ways. Cold cuts, sour cream with lingonberry (tyttebær) preserves and my favorite, smoked trout mousse. You can find the recipe for the mousse here. Peel the potatoes and grate them using a box grater. Fill a bowl with ice cold water, and place the potato shreds in the water. The water helps in making the latke more crispy. Drain the the potatoes and transfer them over to a cheesecloth or tea towel, squeezing out all the water until they are as dry as possible. In a large bowl, whisk the eggs, flour, salt & pepper together. 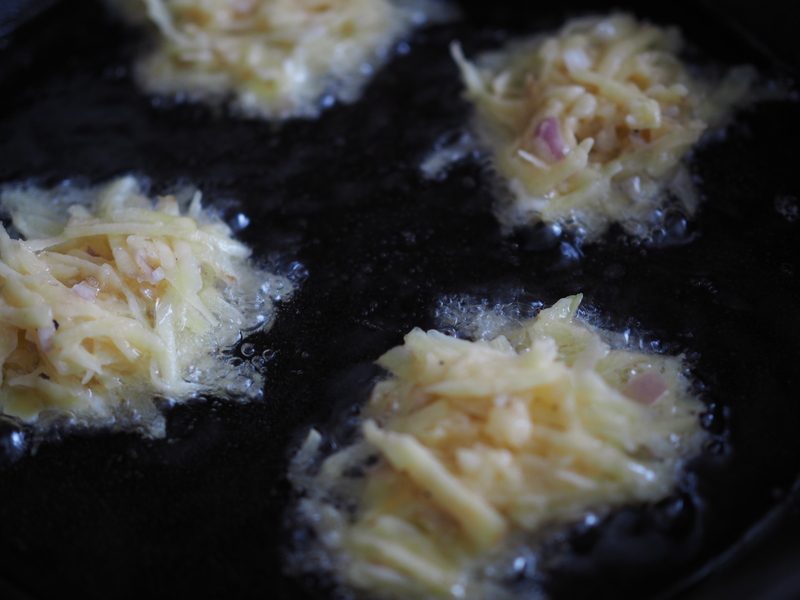 Fold in the grated potato and chopped shallots until everything is evenly mixed. Place enough oil in a cast-iron skillet to cover the bottom and heat over medium-high. When the oil is hot enough, take a tablespoon of batter per latke and spoon into the skillet. You can flatten them with the back of a spoon if necessary. Lower the heat a little and fry until the edges are golden, then flip and fry the other side, around 2 minutes per side. When golden and crispy, transfer the latkes to a plate lined with paper towel. Repeat the process until all the batter is used. Add more oil throughout the frying as needed. After they cool slightly, you can assemble and serve them with your toppings of choice. They can be kept warm in the oven for a bit and also reheated at 200 °c. They taste better eaten right away, but you can also refrigerate them for a day or two.